E-commerce giant Amazon is testing its delivery drones at a secret site not far from the US border, in British Columbia, Canada, according to a new report, as the company has grown impatient with the pace of drone-flight approval in the US. Amazon has gained permission from the Canadian government to work on its Prime Air delivery UAVs (unmanned aerial vehicles), which can reportedly take off from the ground and land vertically as well as fly horizontally, the Guardian reported in an exclusive look at the testing facility. Amazon’s supposedly secret spot 2,000 feet from the US border is stocked with a “formidable team of roboticists, software engineers, aeronautics experts and pioneers in remote sensing – including a former NASA astronaut and the designer of the wingtip of the Boeing 787,” the Guardian added. The team has been assembled to work on various delivery drone capabilities for Amazon, including: “Sensors that can detect and avoid obstacles in a drone’s path; link-loss procedures that control the aircraft should its connection with base be broken; stability in wind and turbulence; and environmental impact.” As each of these new features is achieved, a new Prime Air prototype will be developed. “We are going to end up with unique shapes, unique vehicles. The most important part is to develop strong confidence that our system is safe and that we can demonstrate that to customers,” said Gur Kimchi, the architect and leader of the Prime Air project. 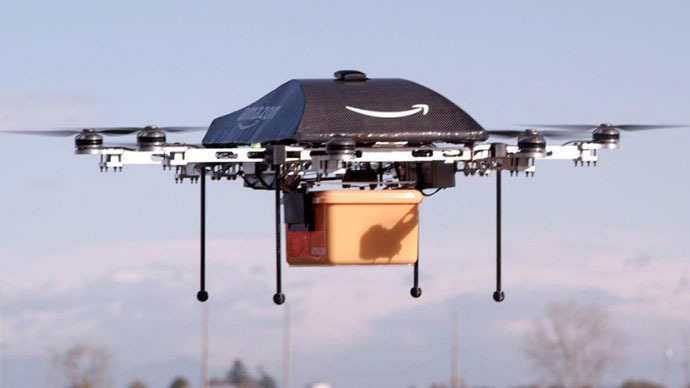 Amazon said Prime Air would carry packages weighing up to 5 lbs (2.25 kg) over distances greater than 10 miles (16 km) at 50 mph in a “slice of virgin airspace,” the Guardian wrote, “above 200ft, where most buildings end, and below 500ft, where general aviation begins." Amazon’s moves in Canada come as US federal agencies – especially the Federal Aviation Administration (FAA) – are currently compiling rules and protocol to safely integrate unmanned aircraft systems into American skies with the goal of proposing a structure this year. Pursuant to the 2012 Federal Aviation Administration Modernization and Reform Act, the FAA is obliged to finally incorporate drones – with supposed privacy protections – into US air traffic by September 30, 2015, though it is highly unlikely that the deadline will be met. Even once proposed, the definitive version of commercial drone regulation will likely take years. “Different laws and regulatory structures in other nations may allow them to act more quickly to approve certain UAS [drone] operations,” an FAA spokesman told the Guardian. Last week, Amazon criticized federal regulators for the slow approval process. Days prior, the FAA said it would allow Amazon to test drone flights under certain conditions, but Amazon said that certain prototype was already out of date. “We don't test it anymore. We've moved on to more advanced designs that we already are testing abroad,” Paul Misener, Amazon.com's vice president for global public policy, said in testimony before the Senate Subcommittee on Aviation Operations, Safety and Security. “Nowhere outside of the United States have we been required to wait more than one or two months to begin testing,” Misener added, omitting the fact that Amazon was testing its drones just outside of America’s borders. Existing FAA regulations allow Americans to fly small drones for recreational use at least 8 km (5 miles) away from any airport and at an altitude no more than 120 meters (400 feet). Drone use is prohibited at night, and a drone operator must always keep the UAV in sight. The FAA might soon propose a “risk-based” blanket exemption from regulations for small drones weighing less than 2.25kg (5 lbs). Neighboring Canada has already approved such an exemption for small UAVs. Unauthorized use of private UAVs near airports and at high altitudes among manned aircraft currently remains the principal headache for civil aviation. From June to November 2014, there were at least 25 episodes when drones came close or nearly collided with manned aircraft, the Washington Post reported in late November. The FAA has said about 7,500 commercial drones will be in the US skies within five years once regulations go into effect. Numerous US companies like Amazon want to begin testing out drones for commercial purposes. Already, more than 750 companies have requested exemptions from the FAA so they can circumvent the ban on UAVs, but the agency has only fulfilled 50 of them. The agency has allowed some commercial drones to fly in American skies. In June, the FAA granted the first commercial drone license to oil giant BP. In September, six Hollywood production companies were granted licenses to use drones while filming television shows and movies. Meanwhile, the FAA has largely told other users, such as photographers and videographers, to cease their drone flights or face fines. Raphael Pirker was fined $10,000 by the FAA for flying his Ritewing Zephyr drone he was using to shoot a video on the University of Virginia campus in 2011. He appealed the fine, but the National Transportation Safety Board later agreed with the FAA in November 2014, stating that current federal regulations defining aircraft as “any device … used for flight in the air” applies to "any aircraft, manned or unmanned, large or small." According to the National Conference of State Legislatures, 20 US states have laws that guide unmanned aerial systems (UAS) usage. Various laws address what a UAS, UAV, or drone is; how government agencies or law enforcement can use them; how the public can use them; how they can be used for hunting; and for use at official FAA test sites around the US. Last week, it was reported that US Sen. Cory Booker is set to unveil a drone bill -- the 'Commercial UAV Modernization Act’ -- that would allow companies to operate small, unmanned drones for several reasons, including mapping crop sites and surveying construction sites. The bill, with lower standards than the FAA is currently considering, would only serve as a temporary guideline until the federal agency has more solid rules ready to go.